In the late spring of 1942, the first P51 Mustangs began operating from England and by October had penetrated into Germany as far as Berlin. The Mustang rapidly gained a reputation for its impressive performance and in 1943 (spring ?) the RLM (Air Ministry) provided the AVA research institute at Gottingen with a Mustang wing. Although this was presumably salvaged from an aircraft that had been shot down, the wing was described as being in good condition. Pressure distributions were measured at several points along the wing and it was found that it had a surprisingly low profile drag. The same wing was then taken to the 8 meter wind tunnel at Luftfahrtforshungsanstalt Braunchweig-Volkenrode (LFA) where Prof Schichtling made further measurements to establish the transition point from laminar to turbulent flow. The wing was carefully smoothed and repainted, although it was found that if the paint was even even slightly damaged by the test equipment, it would immediately cause turbulent flow. At low Reynolds numbers the separation occurred at 50% cord and at 20% at higher numbers. Further measurements in the DVL wind tunnel confirmed that at the Reynolds numbers found at normal airspeeds there was no significant laminar flow at all ! It was therefore concluded that the Mustang’s outstanding performance was actually the result of the low profile drag of its wing section and not because of any (hoped for) laminar flow. After a variety of tests, the same conclusion was reached in both Britain and America. At some point in 1943 a report titled Unschlagpunktmessengen am Originalflugel des baumusters P51 Mustang was published by Kopfermann and Breford and presumably distributed throughout the aircraft industry. As the Hortens were not a recognised aircraft company and were operating unofficially, they were unlikely to be on the distribution list and it is more probable that Walter Horten came across the report in the course of his official work with the fighter inspectorate. Reimar Horten would have already been aware of the theoretical possibilities of laminar flow, and would certainly have realised that the Mustang’s wing section with its low profile drag offered the prospect of a quantum leap in sailplane performance. It is not known when design of the new laminar glider began but logically this must have been sometime between spring 1943 and early 1944. Despite being designated H IVb , the glider was in fact an entirely new design, both structurally and aerodynamically. To allow the performance to be directly compared with the H IV (now labelled H IVa) the same wing planform was adopted , although sweepback was reduced by two degrees in order to move the CG rearwards relative to the mean cord because the aerodynamic centre of the basic wing section was further aft . The original Mustang section was used at the wing root, giving a 14% thickness (compared to the 16% of the H IVa) changing to an uncambered section with the same fairing shape but reduced thickness at the tip. Washout was reduced to 5.6 degrees from the over cautious 7.1 degrees of the H IVa . Like the H IVa, the H IVb was a five piece airframe, a steel tube centre section, two wooden mainplanes carrying the inner two elevons and airbrakes and finally a pair of metal tips carrying the outer elevon and airbrake type drag rudders. The thinner wing section required structural innovations to maintain stiffness, difficult in a swept tailless design. The mainspar incorporated duralumin laminations to provide the necessary strength. A composite D-box leading edge was also developed, drawing on the Hortens previous relationship with Dynamit A.G. of Troisdorf who had funded and provided the materials for a plastic substitute wing for a Hols Der Teufel and later for the all plastic H Va twin engine lightplane in 1936-37. The new composite material was known as Tronal and consisted of an outer layer of 1mm plywood, a core of resin impregnated corrugated cardboard and an inner skin of 0.8mm plywood. This core was 20mm thick at the root and 5mm at the tip (of the wooden mainplane). The composite leading edge was formed and cured between male and female moulds in 2 meter long sections and very few wing ribs were necessary. The area between the main and rear spar was covered in plywood as insufficient Tronal was available to cover the whole wing. A small area behind the rear spar inboard of the elevon was fabric covered, as were the elevons themselves. Uniquely for a wooden wing, after first constructing the mainspar, the rear half of the ribs were then added , followed by the rear spar and trailing edge– and only then was the moulded D box finally glued to the mainspar – the reverse of the usual sequence. The airbrakes were moved from the mainspar, aft to the rear spar, allegedly for structural reasons however it seems more likely that it was to avoid disturbing the hoped for laminar flow. Reimar was evidently aware of the need to construct a laminar flow wing as accurately as possible and noted that his composite leading edge had eliminated sag between the ribs, although he did not specifically try to control or measure cordwise waviness. None the less, special care was taken to keep dust off the wings, dust covers were made to cover them and all handling was done with gloves on. The control system followed the Ho.IVa in having three inter-geared elevons on each wing and airbrake type drag rudders in each of the metal tips – the latter could also be used simultaneously to supplement the effect of the brakes. One minor difference was the use of a skewed hinge drive (a swingee in modelling terms) for all three elevons (H IVa had a skewed hinge on the inner pair of elevons but an external drive to the outer elevon) and temperature compensating devices in the control circuits for high altitude flying. Unlike the H IVa where the steel tube mainspar bent below the pilot, the central tube spars on the H IVb ran straight from one wing root to the other, raising the pilot slightly relative to the wing surface. In other respects the design of the centre section closely followed that of the H IVa, although there were other detailed improvements such as the parachute being placed in front of the pilot for crash protection, more arm and elbow room and a better oxygen installation. The undercarriage of the H IVb was obviously intended to improve on the H IVa which took off on a jettisonable nosewheel to increase its ground angle and then landed on front and rear skids. It must have been difficult to move it around the airfield after landing as there was no practical way of lifting and turning the ‘tail’ of the glider, unlike a conventional type. 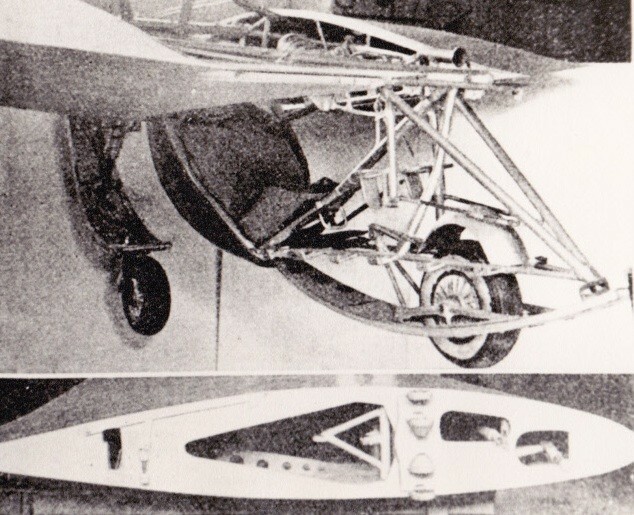 More than one variation of the H IVb undercarriage existed and it’s impossible to identify whether the prototype was successively modified or whether subsequent prototypes used different designs. Similarly we don’t know in which sequence these variations occurred. It seems probable that the prototype used the same retractable nose skid with jettisonable nose wheel as the H IVa but with the addition of a new fixed wheel inserted within the rear sprung skid. Take off was therefore on two wheels and pre take-off ground handling was made much easier. On landing, the nose skid, now minus its wheel, reduced the ground angle and this allowed the front section of the rear skid to touch the ground, increasing friction and reducing any tendency to porpoise. What is presumed to be the second version used the same rear skid/wheel arrangement but now the nose wheel was permanently attached to the nose skid. When the nose skid was retracted, the wheel was drawn into the skid . When the nose skid was lowered for landing, the front wheel remained retracted, so that the landing was purely on the skid. This reduced the ground angle which again allowed the front of the rear skid to touch the ground. A third undercarriage version with a complicated strut arrangement may have existed but this airframe cannot positively be identified as an H IVb. In postwar articles and interviews, Reimar consistently stated that the H IVb had been designed and built at their Bad Hersfeld workshop during a slack period whilst the results of the H XIIIa flight tests were awaited. The prototype H IVb was given serial number 40 and Heinz Scheidhauer is said to have made the first two test flights at Gottingen in December. The glider was then loaded onto a Kranich trailer and transferred to the Hornberg where testing was taken over by Herman Strebel who made his first flight in the H IVb at the end of December 1944. There is some evidence that the timeline of this story is not accurate. It is known that the first hop of the H XIIIa was on 17 November 1944, flown by Herman Strebel. Therefore, if Reimar’s version is correct, the H IVb along with the male and female moulds for the composite D-box, must have been completed in less than a month, along with static loading and torsion tests. This seems unlikely but not impossible. However, the log book of Horten pilot Hans Zubert, shows that on 11 August 1944, he was piloting a Focke Wulf Fw.56 Stosser , coded CA + LV and was aerotowing an H IVb at Gottingen……….. But this was more than three months earlier than the maiden flight of the H XIIIa. As Heinz Scheidhauer was the most experienced and long serving Horten pilot, it is also strange that the test flying of the H IVb should be passed to Strebel at such an early stage. 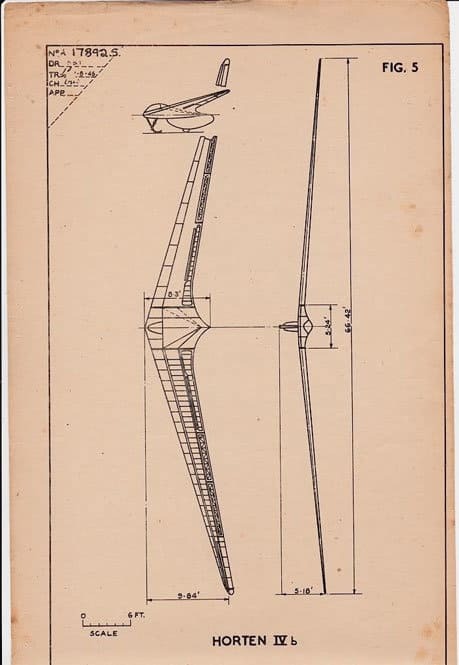 Scheidhauer had flown most of the Horten types and despite some peculiarities, their handling had been generally benign as they were highly stall and spin resistant. Although the H IVa had been liable to flutter, it had proved possible to damp it by simultaneous use of the drag rudders. None the less, he had refused to fly an HIII to explore its handling at extreme rear centre of gravity positions. On 24 May 1944 he made the maiden flight of the ultra high aspect ratio H VI, discovering that not only was it subject to flutter at both high and low speeds but that the entire wing was far too flexible and fragile for even an expert pilot. If Zubert’s log book entry is correct, the pilot of the H IVb on 11 August was almost certainly Scheidhauer and this may also have been its maiden flight – long before the H XIIIa. Unfortunately just ten weeks after test flying the H VI, Scheidhauer discovered that the H IVb suffered from truly appalling handling characteristics and would abruptly drop a wing and attempt to spin at speeds as high as 77km/h, yet above 110 km/h the wings would flutter. Later, also he refused to fly the H XIIIa which Strebel tested from the outset. It seems that Scheidhauer was losing faith in Reimar’s ability as a designer. If this sequence of events is correct, it is possible that the H IVb was damaged in these early flights. Perhaps it did not fly again until December because of difficulties in obtaining further supplies of Tronal, which was in short supply. The prototype H IVb was moved to the famous gliding site of the Hornberg, where the ridge lift was ideal for lengthy test flights. The Hortens had a drawing office in the hangars there and several of their gliders were based at the site. Strebel first flew the H IVb there on 28 December 1944 and whilst Reimar stated that an H IVb had been flown against a calibrated H IVa , the date and place of these tests cannot be confirmed. This type of comparison test usually take dozens of flights to produce reliable results and it is quite possible that the following figures were from a single flight. On his fourth test flight on 18 January 1945 at the Hornberg, Herman Strebel got into difficulties in cloud and the fluttering sailplane broke up, killing him because his static parachute line had not been connected. The prototype Ho. IVb serial 40 had a brief life of around five months. Only 7 flights have so far been identified and the best guesstimate is that it accumulated perhaps 5 -10 hours airtime at most. At some point, work had begun on a series of 10 Ho. IVb sailplanes at a Horten workshop in Gut Tierstein near Rottweil am Necker in the Black Forest. The date cannot be determined but it may have been before Strebel’s fatal crash. It is unclear whether Reimar actually believed its problems could be resolved to eventually produce a world beating sailplane. He later claimed that series production of the Ho. IVb was partly a ‘job creation scheme’, to ensure that his workers were visibly busy and therefore could not be called up to fight on the Eastern Front. This is entirely plausible because at that time, any surplus personnel were being rounded up and sent to a near certain death in a vain attempt to stop the Russian advance into Germany. He also stated that the composite wing was more important than the laminar flow wing section, although this may have been to play down the gliders failure or to interest the Allies in his innovative design skills. By this time he was actively planning how to disperse his aircraft when Germany surrendered, to ensure their survival, even though this risked being shot ! Producing more Ho. IVb might be seen as part of his strategy to maximise the number that might survive the chaos of collapsing Germany. At Gut Tierstein, the main wing panels were being built at a small woodworking shop located near a farm on which Horten personnel also helped with the farmwork. Production rate was said to be about two wing sets per month. The metal wingtips were apparently built at the Hornberg but there is no information as to where the centre sections were constructed. In the book Nurflugel, Reimar stated that no further Ho. IVb were completed. The list of Horten aircraft and sailplane serial numbers in that book ends at no. 44 and only one Ho. IVb , the prototype– serial 40 is recorded . In fact firm evidence proves that a surprising number of additional Horten gliders and aircraft existed but do not appear in that list ! Yet when Reimar was interrogated at Farnborough after the war, he confirmed that a second Ho. IVb, presumably Ho. IVb V2, had been completed and flown. Its wingspan had been reduced to 18.5 meters in an attempt to reduce the tip stalling tendency but actual flight tests showed that this modification was not successful. The theory was that the bad stalling characteristics of the wing section were due to the small nose radius. Partial breakaway behind the maximum thickness point was also suspected, aggravated by span-wise boundary layer drift which rendered the (outer ?) elevon ineffective. Reimar also thought the low Reynolds number at the wingtip made low drag wing sections inadvisable. We don’t know the date or place of the Ho. IVb V2’s maiden flight, nor how many flights it logged. The deteriorating transport situation at that time suggests that it was at the Hornberg which is relatively close to Gut Tierstein. Test flying of other Horten gliders at the Hornberg apparently stopped on 27 March 1945 and around that time several gliders were destroyed when Allied fighter bombers attacked the hangars. Coincidentally another Horten workshop was attacked within days and the brothers may have believed they were being deliberately targeted. This may have prompted a decision to move the Ho. IVb V2 some 600km to the airfield at Brandis, near Leipzig which was intended to become a future (!) centre for Horten development. This was an epic journey given the conditions of the time and probably occurred during darkness due to the threat of Allied aircraft that attacked anything on the road and rail network. The Hortens may also have been influenced by the fact that Brandis was a base for the Me.163 rocket fighter. It was certain that the Allies would send a technical team to investigate the airfield – to discover not only the Me.163 but also the Ho. IVb.V2, Ho..VII.V3 and the Ho. IX.V1 unpowered glider prototype of their jet fighter design which had also been moved there. No doubt the Hortens were told that combat operations from Brandis with the Me.163 rocket fighter were about to cease and that all aircraft on the base would be destroyed before they could be captured by advancing ground forces. To avoid this and in direct opposition to the scorched earth policy, the glider was moved to nearby town of Eilenburg on the Mulde River and was hidden there in the Schwarz Propeller Werke. Surprisingly, the Germans began a vigorous defence Eilenburg and the reaction of the American commanders was to avoid unnecessary loss of life amongst their own troops, so close to the end of the war. Consequently this opposition was dealt with by an almost unprecedented artillery barrage of over 10,000 high explosive and phosphorous shells between 21-23 April, which almost obliterated the town. Two days later, on 25th April an American patrol crossed the Mulde River and made contact with the advancing Russian army at Leckwitz, cutting Germany in half. Although Eilenburg had been captured by American troops, it was in an area designated as part of the Russian zone of occupation and control was passed to the Russians in July 1945. It has previously been assumed that the Ho. IVb V2 , which was hidden alongside the Ho. VII.V3, fell into Russian hands but it can now be seen that it was almost certainly destroyed in April by the intense artillery barrage. In a final attempt to solve the tip stall problem, it was planned that the Ho. IVb V3 would revert to the same wingtip section used on the Ho. IVa, which had a larger nose radius than the laminar section but this machine was never completed. The test pilot Eric ‘Winkle’ Brown, noted that American forces removed three Ho. IVb from the production line at Gut Tierstein, where they also found a complete set of drawings. 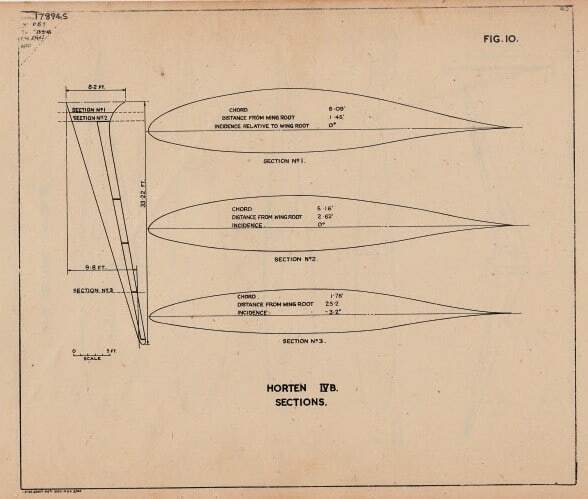 One of these airframes was probably the Ho.IVb V3 which matches the description of an unidentified glider held by American forces and later seen at Neillingen by Philip Wills, along with the Ho.IIIf and Ho.IIIh that are now in the Smithsonian Institute. This unidentified machine was described as having a prone pilot position, with wings that were complete behind the mainspar but had not yet had their D-box fitted. This form of construction was unique to the Ho. IVb and the Ho. XIV. (Note that contrary to the official serial number list in Nurflugel, Reimar later confessed that construction of two Ho. XIV had commenced !!! It unlikely but not impossible that this unidentified airframe could have been the second Ho. XIV ). The two other Ho. IVb removed by US forces were presumably the V4 and V5, which along with the V3 subsequently vanished without trace. Technical intelligence teams targeted the German aircraft industry immediately after the surrender, and initially the Hortens were of great interest. Signals passing between Europe and America reveal some confusion about which Horten types they wished to examine and their designations being in Roman numerals may have been a contributory factor. No specific reference was made to the Ho. IVb and after being removed from Gut Tierstein they were probably transferred to a holding area and then scrapped as being of no further interest. Today, all that remains of the Ho. IVb are some small parts from the wreck of the crashed prototype, including a section of the outer metal wingtip with the serial number 40 stamped on it and part of the leg fairing. Intriguingly, the primary steel tube centre section structure of an unidentified airframe also exists and may be from one those initially removed by American forces, V3/V4/V5 or might have been taken from the production line by a Horten worker – V6 ? As a sailplane the Ho. IVb was a complete failure but it was a brave attempt at a major step forward in performance. The composite leading edge probably contributed to its failure and may have had less torsional rigidity than a wooden structure. The wing section itself appears to have suffered from flow separation over the outer elevon that aggravated stall/spin and delayed recovery, so that the glider over-speeded and reached its low critical flutter speed, leading to structural failure. It was in fact the first sailplane with a laminar flow wing section, pre-dating the Elfe 2 of 1947 and the 1951 Letov XLF.207 variant of the Lunak. David Myhras – The Horten Brothers and their all-wing aircraft – is most revealing as it is a first-hand oral history. The book is basically a transcript taken from tape recorded interviews with the Horten brothers. The numerous contradictions, different versions of events and inconsistent time-lines, are most striking. Any historian is facing a challenge when the words of the designer himself cannot be relied upon. As new information comes to light, this account of the Ho.IVb might well be have to be revised !